Antibodies produced using PolyExpress have ELISA titers as high as polyclonal antibodies produced using a traditional protocol. 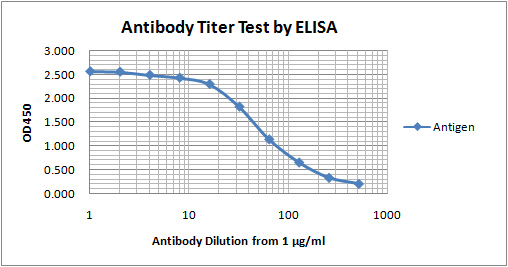 ELISA analysis of purified antibody generated by either PolyExpress protocol or traditional protocol. ELISA analysis of purified antibody generated by PolyExpress Antibody Service. PolyExpress generated an antibody with ELISA titer> 1: 256,000 which is higher than guaranteed.